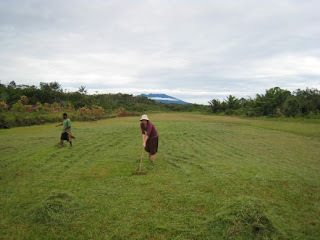 Two days of our time in the village were spent helping to cut the grass on the airstrip. Although from the air it looks like a tiny green stripe in the jungle, imagine 5 football fields end to end… and it was covered in nearly knee-high grass. 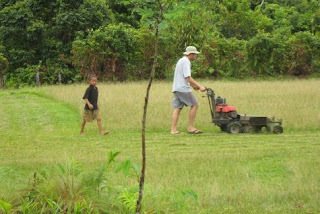 We actually had four lawn mowers, but only a few rakes (4 the first day, only 2 on the second day) and one wheelbarrow. Cutting the grass wasn’t so hard – it was all of the raking and hauling it over to the sides where it could be burned that was the killer. We got nice and sunburned, and came home exhausted, but the airstrip looked pretty nice when we were done.